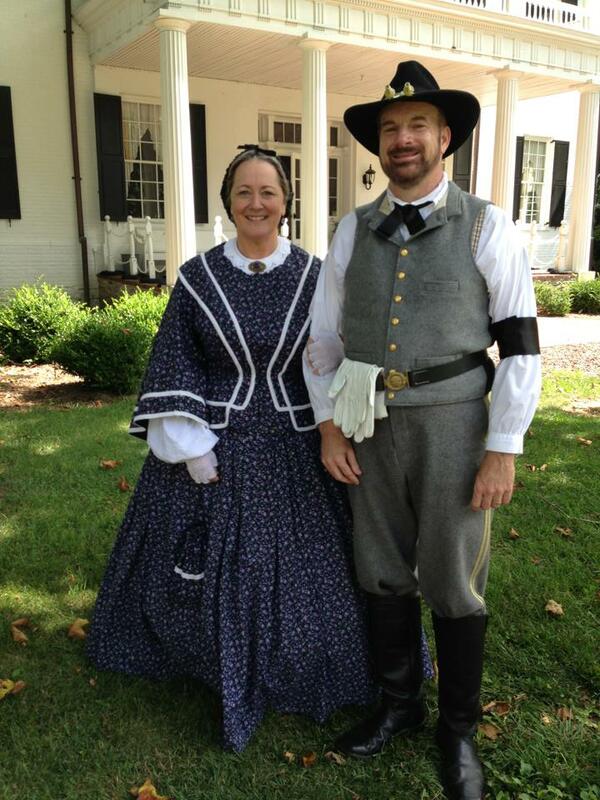 A few weeks ago, my mother-in-law told me about her friend Doug Batson who (like me) is a Civil War buff. 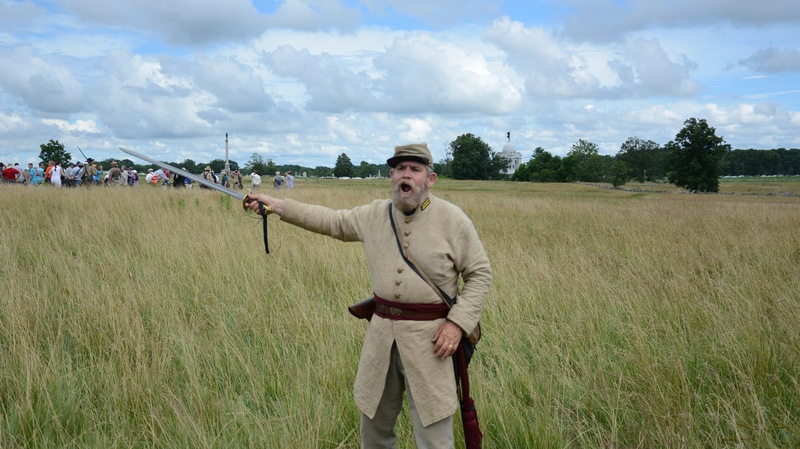 Doug has gone to a little higher level though – he is a living historian who portrays Confederate Major General D.H. Hill. He even got his wife in on it, too. My mother-in-law suggested that it might be fun to go see them at an event. If you’re not familiar, “living historians” are not the same as “reenactors”. These guys portray a specific historical figure from the Civil War and speak, act, and dress “in-character” as if they are that person. They study their man so that they know as much as can be known about them, and then either give speeches or answer questions as that man. When it’s done well, it’s very engaging. So last Sunday, we went out to Frederick and got to see Doug do his thing. It began with an outdoor church service complete with period music. In keeping with the sesquicentennial theme of this year, Doug’s part (as Maj. General Hill) was to give a eulogy for his brother-in-law, Thomas Jonathan “Stonewall” Jackson. Doug did a great job with this, even getting emotional toward the end. He and his wife also wore mourning bands on their arms as was the custom. After the service, there was a “Meet the Generals” session. A few living historians besides Doug were there to talk as the men they were portraying. It was really cool. From left to right, we had Lt. General Jubal Early, General Robert E. Lee, Maj. General George Thomas, and Maj. General George G. Meade. The format of the event was pretty loose – it was supposed to be a question-and-answer session I think, but no one stepped up to start. My mother-in-law and Doug egged me on. Being a Gettysburg nerd presented with this array of characters, I had to ask Generals Early and Lee if their relationship was strained after the Gettysburg campaign. You see, as he moved toward Gettysburg on June 25, 1863, Early’s division passed the Caledonia Furnace (owned by rabidly abolitionist Congressman Thaddeus Stevens) and took the opportunity to torch the place. This could be seen as a violation of Lee’s order not to damage civilian property, so I wanted to know if Lee was upset by the action. “General Early” sternly explained that it was a military target, and went off on a tirade about what the Union troops had done to the south. It was a beautiful thing to watch. This guy was good. “General Lee” was (as you might expect) reserved throughout this exchange. I then turned my attention to “General Meade”, asking him how he felt on June 28th at about 3am. His two-word response, “Heart attack”, was dead-on in my opinion. He had Meade’s look, and seemed to have perfected his attitude as well. I don’t know as much about General Thomas – I need to learn more about the western theatre of the war – but my initial impression was that this guy was fairly new to the hobby. His portrayal was a little more shy than I’d expect from a guy who became known as “The Rock of Chickamauga”. After getting some lunch and chatting a little more with “General Lee”, we got to see Doug and his wife perform a piece as General & Mrs. Hill. They had written a dialogue based on letters that the two had written back and forth during the war, and it was pretty good. We all tell our wives about how our day went, and that perspective is an interesting one (though I’m not sure if it is more honest or less so). The “home front” side of the story is pretty compelling, too and Doug’s wife Terri did a fantastic job conveying that. All in all, it was a wonderful day. If you ever get a chance to see living historians do their thing – especially good ones – you should grab the chance. WARNING: This is a massive post, but I don’t feel like I can break it up. It’s going to take some time to read through. I’ve LOVED Gettysburg since I was a kid. We went there a few times as a family and it was always cool. 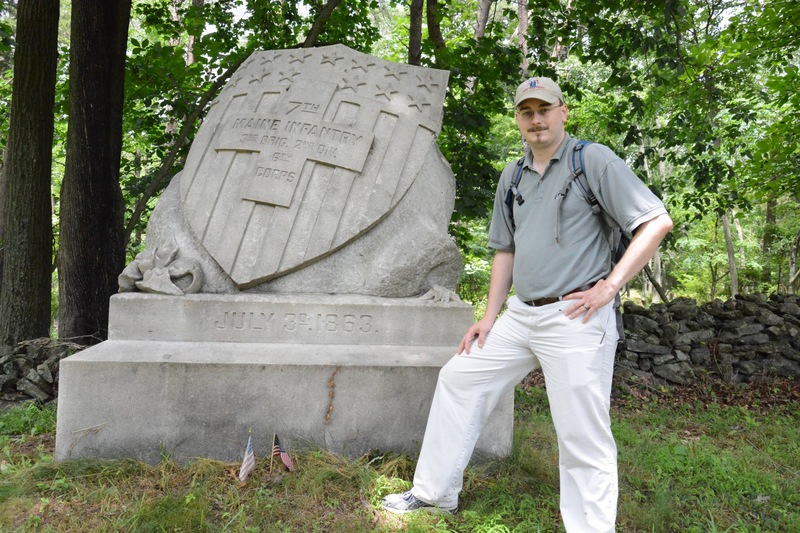 I have great memories of looking for monuments with my dad (especially these things called “flank markers”). I vividly remember learning what “battery” meant in an artillery context on one of those trips. There was even a time when my brother and I “found” bullets (that my dad had sneakily planted minutes before) at the Angle. It’s a big part of the reason that I love history. Gettysburg was my first (and remains my strongest) historical love, but I’ve never REALLY experienced it. Not until this week anyway. Before last Wednesday, I had never been in Gettysburg on the anniversary of the battle. I’ve visited probably about 40 times, but never on those 3 days in July. I was always concerned about the crowds, or I had other things I had to do – there were a million excuses – but this year, for the 150th, I decided that I at least needed to go up for a day. I agonized about which day to choose. I poured over the NPS website, and the schedule of events they had posted, looking for the most interesting collection of real-time tours and events. Much to my surprise, it looked like July 3 was going to be the winner. I say it’s a surprise because the big event on July 3 – the big event of Gettysburg, period – is Pickett’s Charge. If Gettysburg were an album, “Pickett’s Charge” and “Lincoln’s Gettysburg Address” would be the singles. Everyone knows those. They’re always on the radio. As Gettysburg nerds (Gettysburg hipsters, perhaps?) we tend to like the B-sides: “Meredith Avenue“, “Culp’s Hill“, “The Bliss Farm“, and even the never-before-released “Neill Avenue“. We all know Pickett’s Charge and we feel like people who have that as their only impression of the fighting here are missing out on a lot. Boy am I glad I put those feelings aside for one day. But now I’m rushing ahead of myself, aren’t I? When I decided that I did want to go for the anniversary this year, and I wanted to go on July 3, I called up my dad to see if he wanted to go with me. I told him what I wanted to see: the 10:30am East Cavalry Field walking tour, and the 3:00pm Pickett’s Charge. He was a little skeptical at first, but he put those feelings aside and worked his schedule so that he could be there. He came down to Catonsville and picked me up that morning, and we got on the road to Gettysburg. I found out along the way that he had never been to the East Cavalry Field before, so I drove on the way up. We arrived a little before 10:00am, and it was PACKED. The tour was supposed to begin at the Michigan Monument, and since that’s closer to the Low Dutch Road, I took that route. Of course, the NPS had other ideas: the normally two-way Gregg Avenue had been converted to a one-way, and in the wrong direction for us. After snaking around the Low Dutch Road, up to Route 30 and back down, we got parked about a 1/2 mile from the Michigan Monument on Gregg Avenue and made it to the base of the monument just in time for Ranger Jared Frederick (and a steady rain) to begin. The talk was a little more than an hour, and while full of good first-hand, personal accounts of the fighting and aftermath, I think the average visitor was left with the impression that this action was much more costly than it actually was. Not to take anything away from the men who fought there, but as Civil War battles go this wasn’t much more than a skirmish – it certainly wasn’t at the level of Pickett’s Charge in terms of bloodiness. 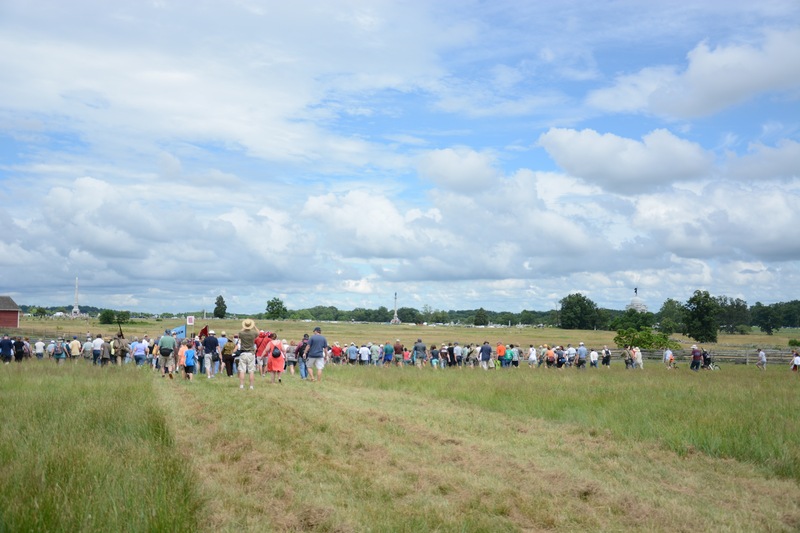 The program also didn’t do a great job of explaining the movements and flow of the battle – a hard thing to do on the East Cavalry Field, I’ll grant – but somewhat disappointing for what was billed as a walking tour. 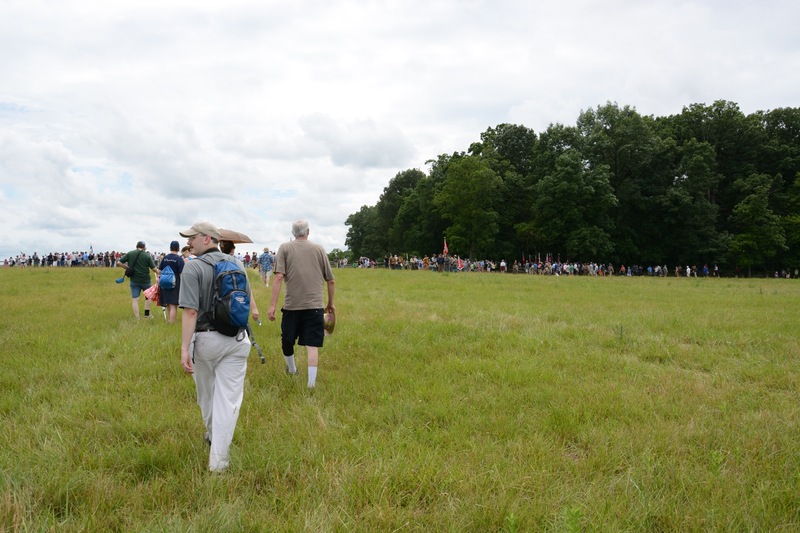 At the same time, it was nice to see so many people (around 1,000, I’d say) out for a tour of one of the more esoteric parts of the battlefield. And the rangers did a MASTERFUL job organizing this tour and handling logistics. I should have immediately taken both of these as a good sign for things to come. From East Cavalry, we started to head into town to find some lunch. Since we were coming in on the Hanover Road, I decided to stop off at another place my dad had never visited: Benner’s Hill. This is where the Confederate artillery that fired on Culp’s Hill and East Cemetery Hill was placed. Most visitors (like my dad) never bother to get the Confederate perspective on those actions. Doing so makes it pretty obvious why they failed. I directed him to turn right onto Highland Avenue Road, and then take a left when we got to Clapsaddle Road. I didn’t tell him what we were going to see. I think the “Clapsaddle” name made him think that this was another cavalry-related site. Little did he know I was taking him to the ultimate of the Gettysburg “B-sides”. When the road came to a dead end, I asked him to park on the left, and I grabbed my backpack full of water bottles and started looking for a trail. Now my dad got nervous. After a few moments, I found the start of the long-neglected trail (just look for the area between the “No Trespassing” signs) and led him down the hill to the southwest. Just before Rock Creek, the trail becomes much easier and takes a sharp left, heading up the northwest slope of Wolf Hill. Since you don’t see what you’re walking toward until you’re right on top of it, I was able to keep the surprise going – I was taking him to Neill Avenue. The Extreme Right of the Union Army. Unfortunately, the marker’s seen better days. It was really nice to be able to visit this spot on the anniversary of the event here. We didn’t see another soul for the 45 minutes we were on the trail and up at Neill Avenue. It’s a really special place for that reason – even on one of the busiest days in the history of Gettysburg National Military Park, there are still a few places where you can have a solitary moment. At the same time, these men deserve to be remembered too, and I wish there was an easier way to allow people to visit this place. We worked our way back up the trail, and drove back to the Baltimore Pike to try to park at the visitor’s center. 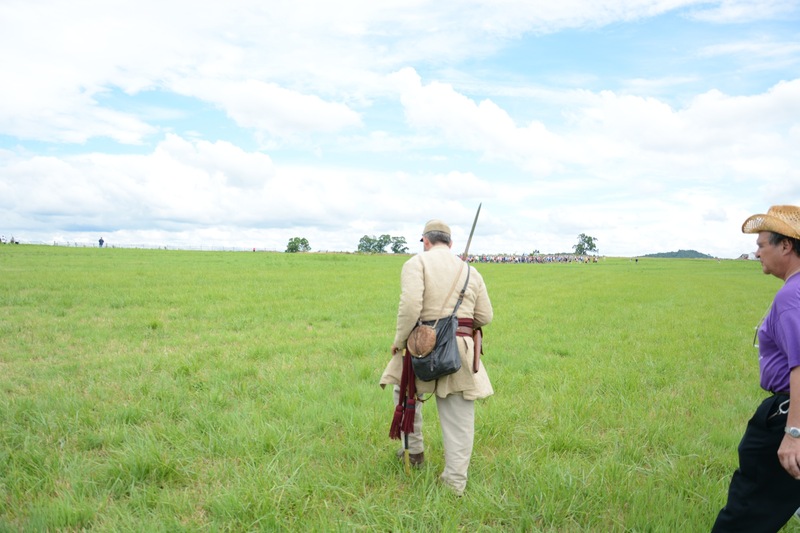 It was just before 2:00pm, so we had almost an hour to get in-position for Pickett’s Charge. Every lot we passed was full. Even fields that were being used as temporary parking for the event were maxed out. I was getting nervous. As we continued up the Baltimore Pike, we noticed that there were spots along the road. There were no parking restrictions posted, and we were within easy walking distance – just a few hundred yards north of Hunt Avenue. We pulled off and parked. I grabbed my water-filled backpack and the cameras, and we started walking. As we came around the bend in the woods along Hunt Avenue, I got my first look at Cemetery Ridge that day. It was FILLED with people, and a steady stream of visitors – 6 people or more across – was making its way up the slope between the Leister House and the Meade Monument. 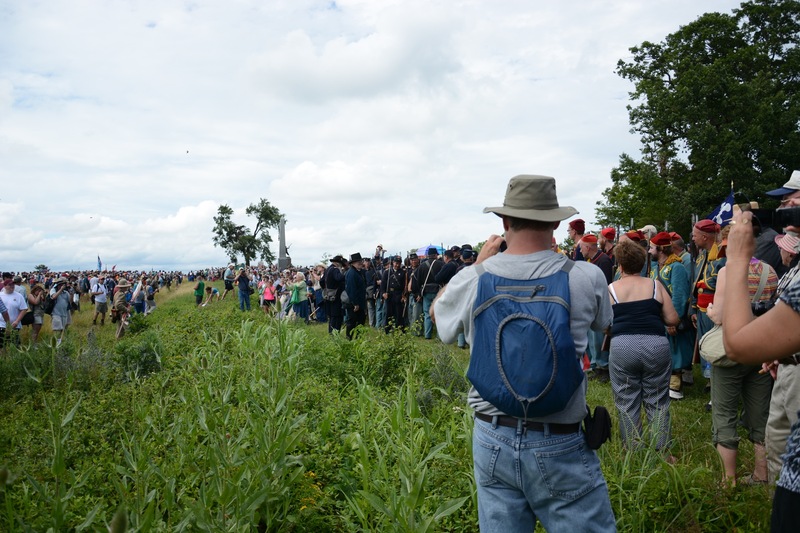 I’d never seen so many people anywhere at Gettysburg before. On top of the ridge, we found thousands of on-lookers with lawn chairs. There were satellite trucks for the news organizations covering the event. Temporary stages had been erected where Rangers and LBG’s were giving interviews and commentary to TV crews. 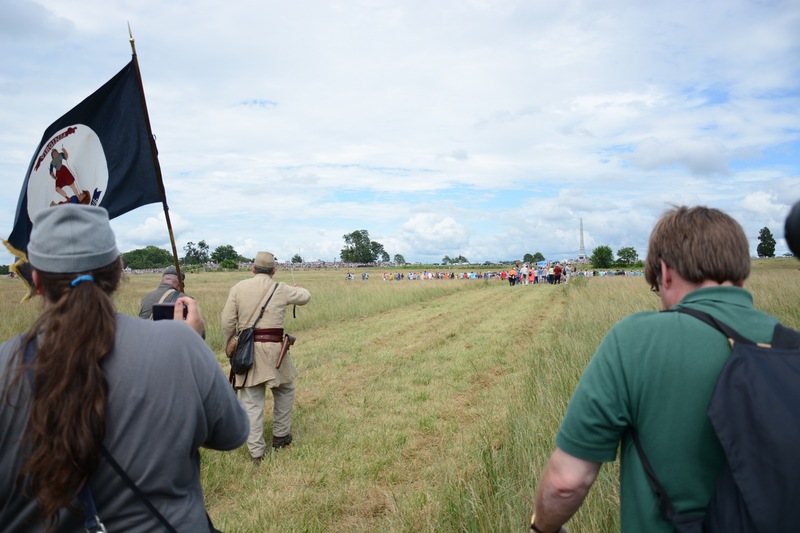 And once again, a steady stream of people were heading west, walking across the fields to join up with the “Confederate” lines already forming on Seminary Ridge. This is why I wanted to be here. 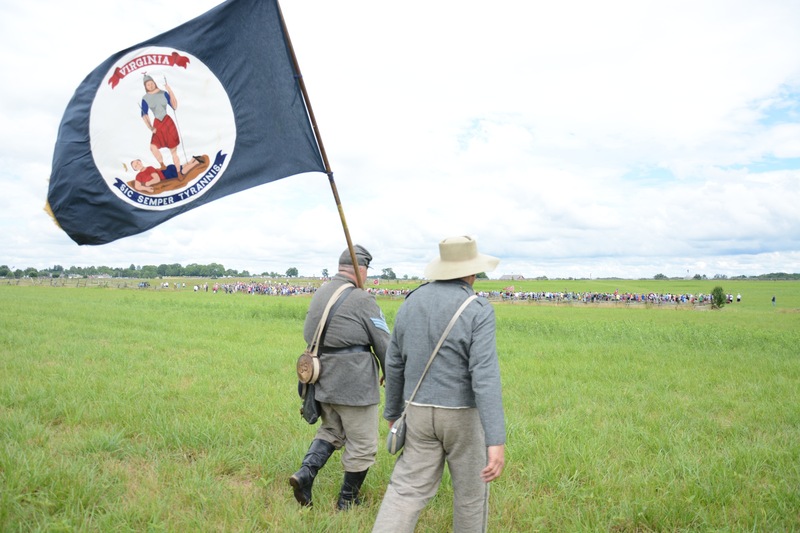 The 3:00pm Pickett’s Charge event was to be a recreation of the famous attack, put on by park visitors lined up in the formations of the 9 brigades that made the charge, 150 years ago to the minute. If I didn’t participate in this, I at least wanted to see it. When we saw the line of people crossing the Emmitsburg Road to participate, my dad and I knew we wanted to go along, too. I led us down to the Angle, where a park ranger was helping people over the wall who wanted to go all the way across. Before we reached the Emmitsburg Road, an older man was kneeling down along the trail. Since it was a hot day, my dad became concerned that perhaps this man was having a medical issue. He reached down and asked the man if he needed help. The man explained that he was praying. He had an ancestor who had participated in the charge (I believe he said as part of the 14th VA), and this man was taking a moment to reflect on that service and to pray for our country. My dad especially (though he’s not a particularly religious man) was touched by this. Everyone who was there that day had their reason. We made our way across and I explained some of the particulars to my dad of how the charge went down. You can’t really understand what the Confederates were up against until you get out there in the middle of that field. It looks like just a flat, wide open field a mile across, but in reality it is a series of small hills and valleys and you sometimes can’t see things until you’re right on top of them. In a smoke-filled, hot and humid battlefield – like it was on July 3, 1863 – this is even more the case. We made it to the other side and found our way to Armistead’s brigade. Not being true southerners ourselves, he was our closest connection to the attack. Brig. General Armistead was the nephew of the man who defended Fort McHenry in Baltimore, and both he and his uncle are buried in our hometown. Being the supporting brigade of the attack, it would also give us an excellent view. Since we were among the last to arrive, we ended up on the far, southern flank of the brigade. At 3:00pm, the brigades in front of us (Garnett’s and Kemper’s) stepped off, while our own made a left face and started walking in what I considered to be the wrong direction (I assume this was a traffic control measure – there are only so many gaps in the fences). I wasn’t the only one who thought this – we had some living historians right behind us. This 1LT took charge of our ragged demi-brigade. As the men in uniform came up through our ranks, one of the visitor’s asked what we were supposed to do. The 1LT above said, “I don’t know what the plan is, but this is what we’re doing!” I don’t know how all of you feel, but if there’s a man with a drawn sword, you FOLLOW THAT MAN! The living historian flag bearer. Sic Semper Tyrannis, indeed! That’s Garnett’s Brigade to our front left. While there in an unofficial capacity, these guys did a great job with our group. They kept us in line, at times stopping to try to get us reformed more properly. We also learned the proper Rebel Yell for when we got past the Emmitsburg Road. Going up the slope about 1/3 of the way across. Note the hill on the right – that’s the tip of Big Round Top. We can’t see any of the monuments at this point – not even the massive Pennsylvania Memorial. At the top of the slope, we paused to reform our lines, and to keep from running into Kemper’s guys in front of us. The 1LT trying to dress our lines to the left in preparation for the left oblique up the ridge. Remember – Listen to the man with the drawn sword, kids! The Yankees (and the news crews) are waiting at the wall. Eventually, we made it. The 1LT gave a speech about what we had just done, and saluted the waiting Federal troops. We were ordered to “break ranks”, and by this point, we were glad to. At the end of the march, we sat down on a rock and broke out some water. People were milling around and taking in the awesome scene that we had all just been a part of. After a few moments, a Union bugler started playing “Taps”. As he finished, another picked up, and all down the line the buglers took turns – 12 in all, I think – playing a tribute to the men who fell 150 years before. I honestly can’t describe how amazing this whole experience was. 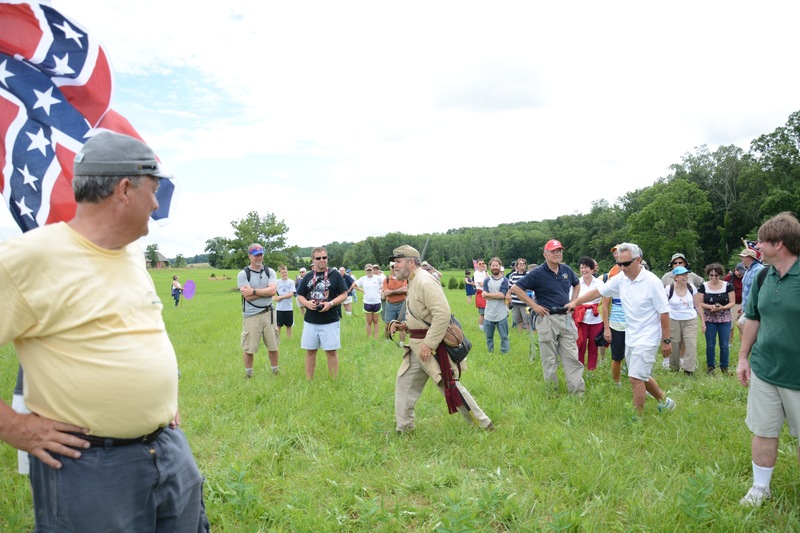 Like I said at the outset, Pickett’s Charge is the most well-known part of the Battle of Gettysburg – not exactly something that would feel like a new, amazing experience for a guy like me, but it did. Whether it was being led across by a 1LT who knew his stuff, or that there were thousands of people beside me, or thousands of people in front of me, or that my dad was there; this was a unique and memorable, once-in-a-lifetime experience. The NPS did a FANTASTIC job with this event. If they did this every year, I’d be there. 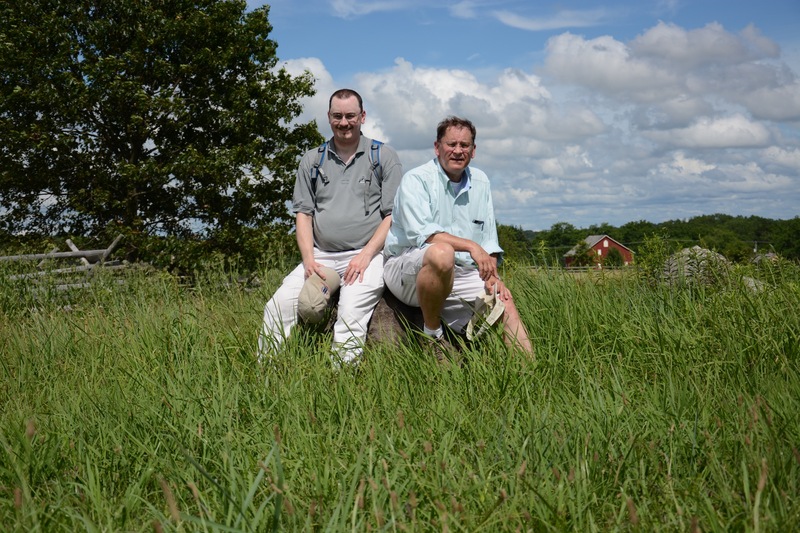 My Dad and I on Cemetery Ridge. You’d never know it, but we were completely surrounded by 15,000+ people when this was taken. It was such a tremendous experience, I still can’t believe that I actually got to do it. My thanks go to my dad (for coming along), my wife (for handling things at home while I tramped around a battlefield), and the NPS for putting all this together and making it run so smoothly. I don’t think I’ll ever forget this. After the failure of Pickett’s Charge, the Union cavalry decided to try their own flanking movement just about now, 150 years ago. 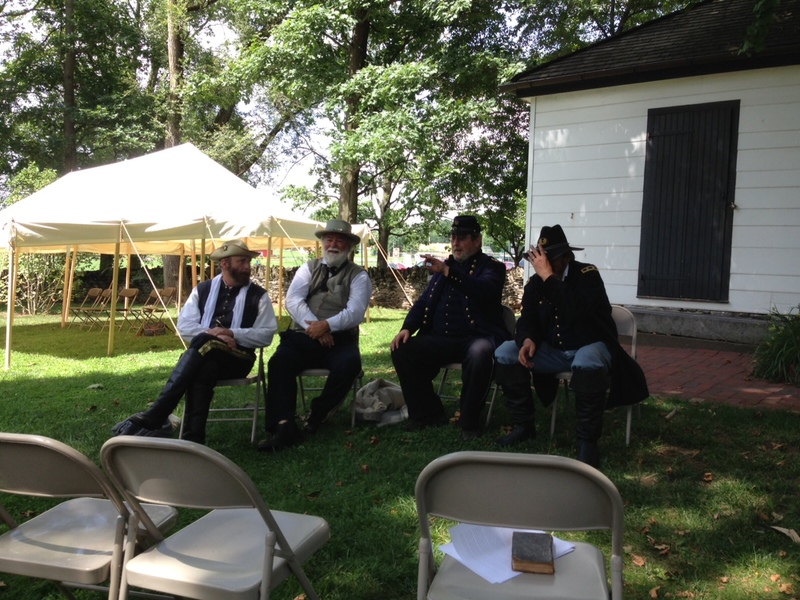 The brigades of newly-appointed Generals Elon Farnsworth and Wesley Merritt, under the over-all command of Brig. General Judson Kilpatrick, would probe to find the Confederate right flank. Merritt’s men would be on the left of the advance, fighting dismounted up the Emmitsburg Road. Determined fighting from the Confederates of Law’s division, and sufficient reinforcements on their side, meant that this attack stalled. On the right, Farnsworth’s men were in the woods on Bushman’s Hill. They would charge through the rocky forest on horseback – not the best choice. The attack would become disjointed, and the young Brig. General Farnsworth would pay for Kilpatrick’s poor plan with his life. The Confederate flank would not be turned, and with no frontal assault coming from Cemetery Ridge, the Confederates were safe for the night. With the failure of this Union attack, the combat at Gettysburg was over. In 3 days, nearly 170,000 men had fought here, and 51,000 became casualties. It is the bloodiest battle ever fought by Americans in any war, and the largest and bloodiest ever to take place in the western hemisphere. The massive numbers of dead (over 8,000) will lead to the creation of the first National Cemetery here in the coming months. On November 19, 1863, at the dedication ceremony for that cemetery, Abraham Lincoln will give one of the greatest speeches in American history. His “appropriate remarks” will bring meaning to the devastation, and a purpose to finishing the war. Not enough men broke through the Union defenses. There was no follow-up, no support, and (most importantly) no shattered Union army. By this time 150 years ago, the men who were going to make it back from the failed attack did. General Lee was concerned that there’d be a Union counter attack, but none came. General Meade wasn’t about to abandon his good defensive position to stumble into what might be a trap. Pickett wasn’t too far off. The attack had been a complete disaster. The units that made the charge took 50% casualties. Every field officer in Pickett’s division was a casualty. All three of his brigade commanders were lost. Pickett himself was never the same after this, and he never forgave Lee for doing this to his troops. For his viewpoint, he was ostracized after the war by the rest of the southern generals. Calling out Lee was absolutely forbidden. For his part, Lee took full responsibility himself. He realized that his over confidence had led to this tragedy. Under Lee’s leadership, the Confederates would lick their wounds and begin the retreat back to Virginia. The barrage had done as much as it could do. Longstreet didn’t like the idea of this attack at all – he spent much of the afternoon trying to avoid giving the order to proceed, even going so far as to try to trick Col. Alexander into doing it. The subordinate division commanders kept coming to ask when the attack would start – finally Maj. General George Pickett brought a note from Col. Alexander stating that the Confederate ordnance was nearly out. When Pickett asked if the attack could go forward, all Longstreet could manage was a nod. Longstreet was in over-all command. The attack included the division of Maj. General Heth (temporarily commanded by Brig. General Pettigrew), and a mixed division under the command of Maj. General Isaac Trimble. While his name gets top billing on the charge, Pickett’s division made up only about 1/3 of the attacking force. Perhaps this was because his were the freshest troops on the field, or because they ended up making the farthest advance of the day. Either way, the attack is more properly called “Longstreet’s Assault” by most serious historians. 150 years ago right now, the 13,000 men who would take part in the charge came out of the tree line on Seminary Ridge and began the advance. They would cross nearly a mile of open fields, under fire from Union artillery the whole way. 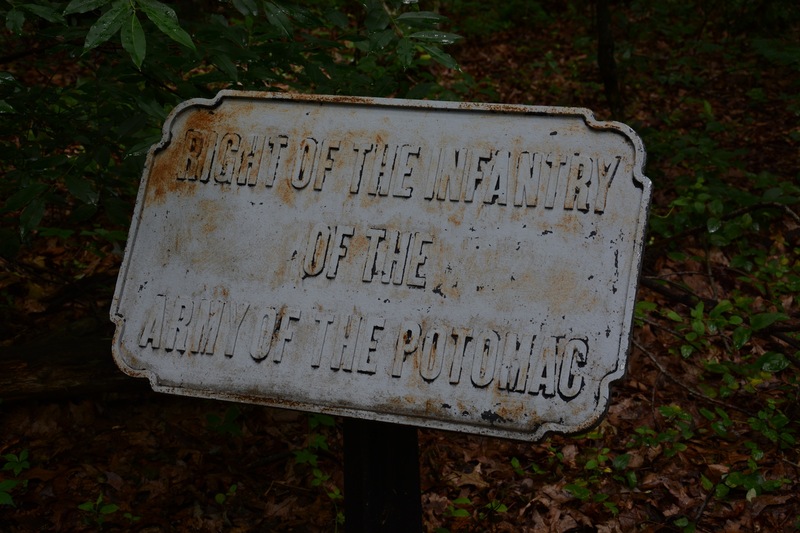 There were two fences that would have to be crossed along the way and for the last leg, the fire of tens of thousands of Yankee rifles to contend with. Like I said, some of Pickett’s men did make it over the wall. Nearly 1,000 men broke the Union lines, but that wasn’t enough to last. The Confederacy had reached its high tide. When J.E.B. Stuart fired off those cannons to signal Lee, the alarm was instantly raised. Brig. General David McMurtrie Gregg brought his men – two brigades under the command of Col. John McIntosh, and newly-appointed Brig. General George A. Custer – up the Low Dutch Road to meet the threat to the Union rear. By this time 150 years ago, they were in position to do something. It began with an artillery duel. The well-trained Union gunners were able to overpower Stuart’s horse artillery. J.E.B. would need another trick to get past them. He decided on a flanking movement, but he was blocked by troopers from the 5th Michigan Cavalry. Just as he had them breaking, the 7th Michigan counter-attacked, personally led by General Custer himself. Fighting would swirl around these fields for less than an hour. Charge and counter-charge happened again, and again General Custer and his Michigan boys made the difference. The struggle came to a head when Col. McIntosh’s brigade was able to flank the Confederates, wounding Confederate Brig. General Wade Hampton in the process. In mass confusion, and nearly surrounded, the Rebel horsemen had no choice but to retreat. While relatively light on casualties for both sides, this little-mentioned action represented another step up for the Union cavalry, and another missed opportunity for J.E.B. Stuart and the Confederates. The tides were slowly turning. In preparation for the infantry assault against the center of the Union line on Cemetery Ridge, General Lee ordered a massive artillery barrage. It would be the largest of the war. Nearly 150 guns from all three Confederate corps would participate. With any luck, the concentrated fire of all these weapons would damage the Union guns and cause the infantry to flee in panic. It would have to be perfectly executed, as the Confederates had little ammunition to spare.
. Before the day was out, he’d be placed in a very awkward situation. 150 years ago right now, the firing commenced. It didn’t take long for the Union guns to respond. With both sides blasting away, the area around Gettysburg became a loud, smokey mess – so loud in fact that the barrage was heard as far away as Washington, DC and Pittsburgh, PA. It was impossible to see what the enemy was doing through all of that, and whether your own fire was having an effect. on artillery before the war) – to recognize that this wasn’t merely an artillerist’s duel. This was the clear prelude to an infantry assault. 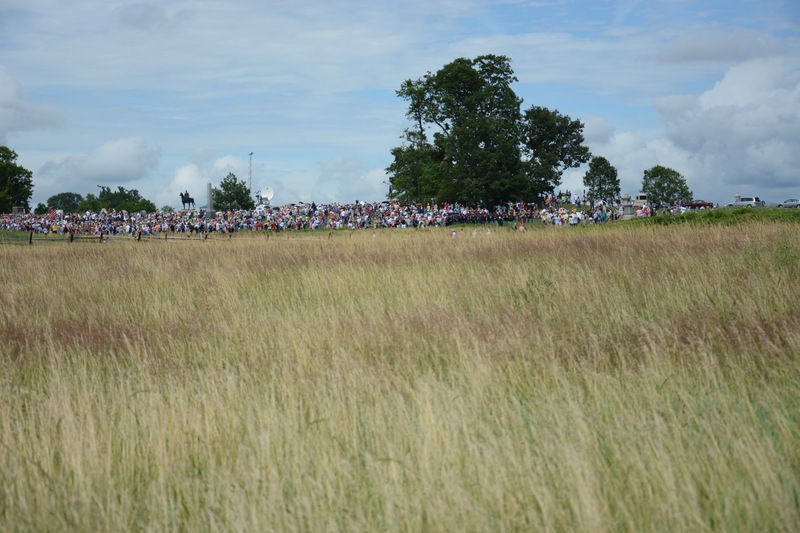 The Rebels would charge across those fields as soon as they thought they’d inflicted enough damage – Hunt was sure of it. He ran around to each of his battery commanders and told them to slow down. The infantry commanders were furious – the artillery should be returning fire vigorously! There was a method to Hunt’s seeming madness. Not only would slowing down conserve ammunition for the coming infantry attack, it would lull the Confederates into thinking that there was a steadily decreasing number of guns firing back at them – perhaps they were damaging the Union defenses! After an hour and a half of this, the Confederates were running low on ordnance, and were taking too much damage from the Union return fire. The Rebel artillery was going to be forced to stop soon. While the fighting resumed on Culp’s Hill early in the morning, General Lee came up with his strategy for the day’s action. Originally, he wanted to repeat the attacks on the left and right from yesterday, hoping that more ground could be gained this time. Lt. General Longstreet convinced him that the Union left was well-situated on the ridges south of town. Lee changed his strategy – he would launch an attack that would become famous against the center of the Union line, and his cavalry would have a part to play this time. The Confederate artillery would break up the Union defenses, the infantry would push the Yankees off Cemetery Ridge, and the cavalry would be waiting to mop up the remains. J.E.B. Stuart was to go around the Union right, probing for the rear of the enemy. Once he found it, he should signal General Lee to let him know that the cavalry was in position. 150 years ago right now, four cannons fired off on Cress Ridge near the Rummel Farm – one blast in each compass direction. This was the signal. Unfortunately for Maj. General Stuart, his commander wasn’t the only person to hear it. Federal artillery on Powers Hill and along the Baltimore Pike, opened fire on the Confederates occupying the lower portion of Culp’s Hill, 150 years ago right now. During the night, both sides had reinforced their lines, though the Union boys were in a much better position. For the next 6 hours, fighting would rage all along the wooded hillside. It was too loud to effectively convey orders to the men. Thick black powder smoke added to the pre-dawn darkness to create a throughly confusing situation – especially for the attacking Confederates. The southerners made a few more attempts to take the hill, and were repulsed each time. There was even some Maryland on Maryland fighting (complete with a few cousins fighting each other) – the only instance of a State having men on both sides of a fight at Gettysburg. In the end, the Rebels couldn’t take any more ground, and the Yankees couldn’t completely drive them off. Both lines essentially returned to their original positions by about 10:30am. Even though the main part of the fighting had ended, the close proximity of the two armies on Culp’s Hill led to a few volleys being blindly fired into the dark by both sides. 150 years ago right now, one such short firefight broke out. There was another one about an hour later around 2:00am, and one more right before the battle resumed in earnest around 4:00am.